GingerBread Lane doesn't just pop up anywhere there is exhibition space. Jon is very particular when it comes to locations for his delectable creations. Though GingerBread Lane has been viewed in science and children's museums, theme parks, shopping malls, casinos, hotels, restaurants, and even the Rockefeller Center, it wasn't a fly-by-night decision made by anyone involved. As soon as one season ends, the arduous task of looking for new venues, as well as re-booking old ones becomes the priority. Jon tours facilities, talks to CEOs and Executive Directors, or spends countless hours on the phone, researching just the perfect fit for GingerBread Lane so that the audience is properly captivated, coming back for more. Once a location has been agreed upon, Jon spends innumerable hours building a relationship with his venues; many of them returning the many frosting filled seasons. Jon's dedication to his masterpieces isn't just on the surface. 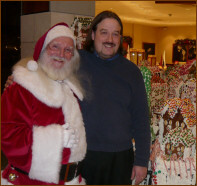 It has been a dream for him, since its inception, to make GingerBread Lane his full time commitment. A former executive chef turned self-taught gingerbread baker, Jon has the chops to bring his baked brand of joy to the public-at-large. He graduated with a degree from the Culinary Institute of America in New York, has over 25 years of experience in the restaurant business under his belt, and has been the Executive Chef in prestigious spots such as the Plaza and the Algonquin in NYC, and even worked across the street from the White House at the Hay Adams. He gave all of that up in 2015 to pursue his dream of making GingerBread Lane, his once-hobby, a full time labor of love, and dream come true. The looks of awe and wonder on the faces of the patrons are the main reason for such a monumental undertaking. To Jon, every hour of dough making, frosting, and decorating gets paid in full when he sees the joy-filled reactions during the holidays. The confectionary delights are assembled in New York City, and carefully delivered to their respective locations, where Jon oversees the architecture of each individual display personally. Be sure to keep an eye on the GingerBread Lane website to find the locations nearest to you. Don't forget to visit the site often to get updates all year long on progress, or marvel at interesting facts and figures about displays past and present.